Commoners sky gardens which are also leading estate developers in Islamabad they recently launched commoners gold valley. Project offers various sizes of 5 Marla, 10Marla, Kanal and 2 Kanal residential plots on installments located at main express way 20 minutes drive away from Islamabad convention centre. As you see in above advertisement confirm booking for limited plots with registration forms is open now there is no last date of booking reveal yet. As you see in above advertisement booking forms are available at Hall Mark estate . But moreover these registration forms are only available in Islamabad and Karachi. If you Are in Lahore you should contact to Karachi or Islamabad dealers too . 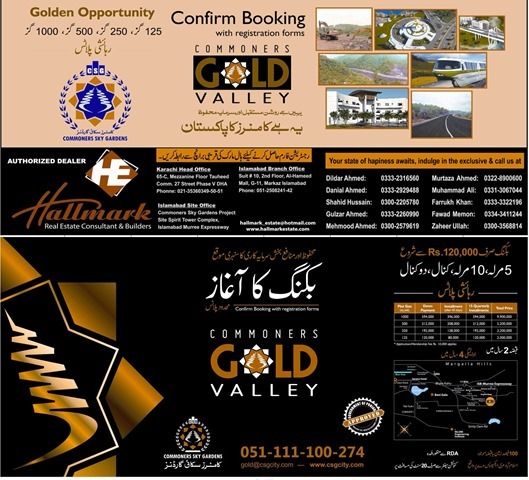 When i talked to their spoke person he said that there is no authorized dealer in Lahore yet who is dealing on their behalf for Gold valley. And also booking forms was Rs 10,000/- initially but now there is no specific figure. Sir, is this a trustworthy developer. I am not an investor. I want to have a plot and later build my own 8 marla house in Islamabad. Should/can I select Commoners Gold for this purpose.